As summer draws to an end, we have to bid goodbye to our loyal friend, the pool. You can opt to close your pool yourself or hire a professional. They're both valid options. If you choose to DIY, though, be careful! 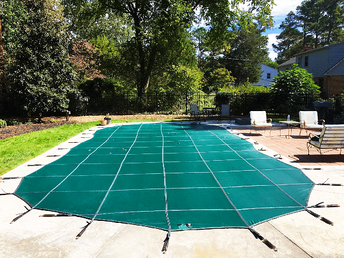 Many pools across the country get damaged because they were improperly closed and winterized. River Pools specializes in manufacturing and installing fiberglass pools, and we educate on all three pool types through our blog articles and videos. We know pools. And we're here to help you take the best possible care of the backyard oasis you've worked so hard on. As a general rule, you should close your pool before it gets below 30°F (-1°C) at night. For most of us, that means pool season is late May through early September. If you have more swim time than that, I'm jealous. Invite me over. Lots of trees around your pool? Those leaves will make a huge mess when they fall. We recommend closing your pool before they do. Got a robot pool cleaner? It's doing its best, but you'll probably need to put it away early. Check the manufacturer's instructions for its temperature limits—running your auto vac at lower temps may damage its motor. Brush, shock, and sanitize and balance the pool thoroughly. Add 10 ounces of algaecide per 10,000 gallons of pool water. Add metal remover/sequestering agent as per manufacturers instructions. Vacuum any debris off the pool bottom. Allow pool chemicals to filter for 24 hours. Drain water down as necessary, but not below the skimmer for fiberglass pools. Remove all plugs and water from pump and filter system, including any heating elements like a heat pump. Blow out pool's plumbing lines and plug all lines. We recommend using an air compressor. Be sure to add a skimmer plug, called a "Gizzmo," to the skimmer. Remove any ladders or handrails. Place the cover on top of the pool and secure it. For solid vinyl or tarp covers, remember to place a pump in the center of the cover to pump off any rainwater. We know this is a lot to remember, especially if it's your first pool closing. And for fiberglass pools, do not to lower the water level below the skimmer. It can void the warranty. It also runs the risk that water around the pool can build up hydrostatic pressure, which is bad news. If you’d like to learn more about the different types of pools, check out our comprehensive ebook "Comparing Fiberglass, Concrete, and Vinyl Liner Pools in the Modern Age." It discusses everything you want to know before making a big pool decision: cost, design, surface durability, installation time and messiness, and more. All year round, River Pools manufactures and installs freeform and linear fiberglass pools in Virginia and southern Maryland. We also operate in other areas of the country through our nationwide dealers. Any questions about pools and their maintenance? Get in touch with us. We want to help you make the most of your pool! Next: Does My Pool Need Winter Maintenance?